Become the master of time mainternance! My Time Organizer will allow you to plan your schedule in the easiest way available. Application is available free of charge for Google Chrome and Chromium browsers. Organizer that lets you manage your time adding notes, events and tasks in an easy, intuitive way. 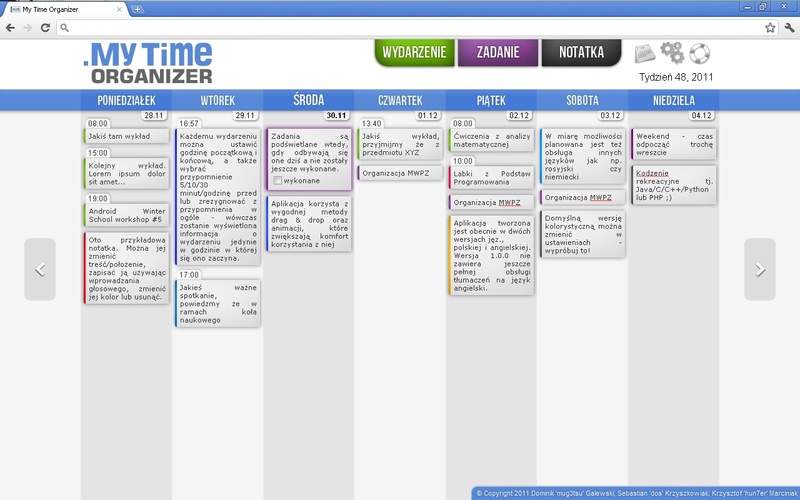 My Time Organizer is an application that lets you manage your time in the easiest way from the user's point of view. You can add info about events, tasks and/or notes and have yourself notificated about upcoming events/lectures/tests/exams/etc. Organize your time in advance using month-view! Plan your future events and tasks, and store important notes directly in your web browser. Access to your data at any given moment, even without an active internet connection. Organize your time with an easy to use drag'n'drop interface including eye-catching animations.